The Mystery of the Sword in the Stone….There’s a magical and mystical place in Tuscany…… actually like no other in the whole world! 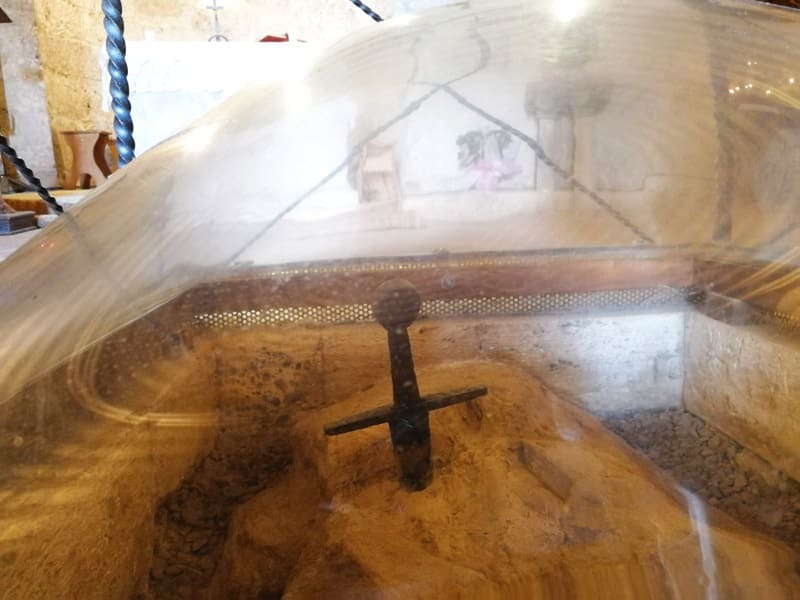 I’ve visited it yet again only a few days ago…..
A beautiful but quaint location full of mysteries, that looks after the authentic Sword in the Stone, a medieval sword deeply stuck into a mass of stone and actually dating back to the 12th century. It probably inspired the more famous legends about King Arthur and his Knights of the Round Table! We are in a location where nature is still the main protagonist; the Natural Reserve of Val di Merse, one of the less known areas of Tuscany, yet so intriguing and full of surprises, with many little and fascinating hill villages. 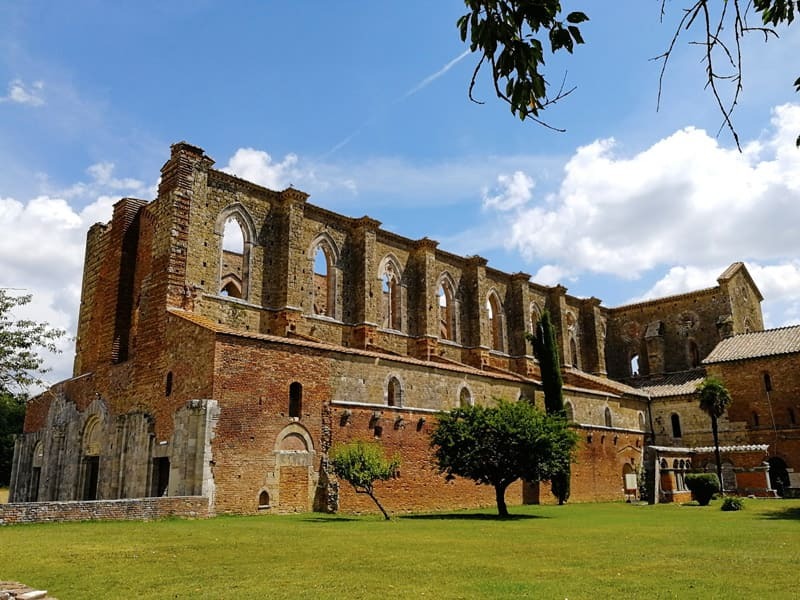 South west of Siena, near the scenic hill town of Chiusdino, is the suggestive Abbey of San Galgano, completely roofless! The abbey is absolutely beautiful and very scenographic, to the point that has become a popular location for unique weddings in Tuscany. The abbey is also the exclusive location for concerts of classical music. From the abbey, through a short but steep path, we reach the Eremo di Montesiepi, hermitage of Montesiepi, still today subject of continuous studies and research. The Eremo di Montesiepi is a very original building with a circular plan, rich in symbolic elements, which jealously guards the famous Sword in the Stone and its mysteries. 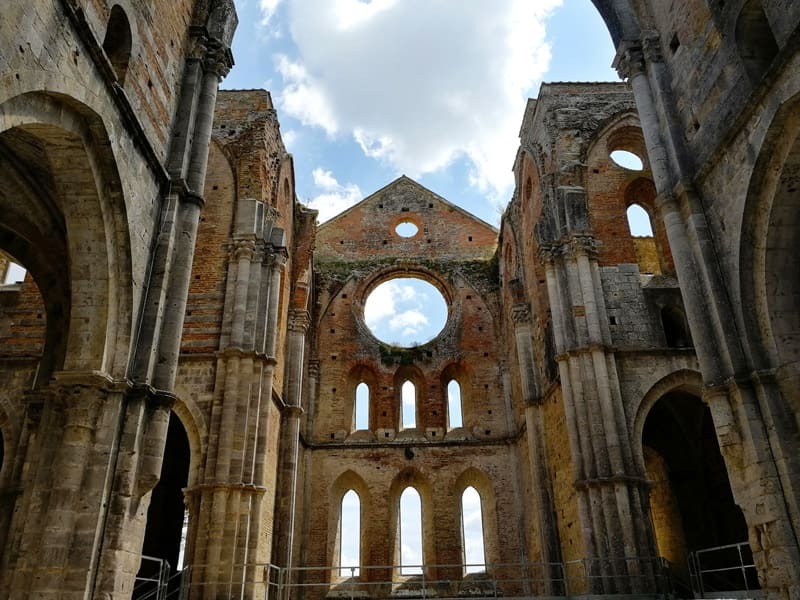 The sword stuck into the rock at San Galgano is the opposite version of the famous Excalibur, extracted from the brave King Arthur, and endowed with amazing powers. This is the real Sword in the Stone, existing even before the famous sword Excalibur, told in the ‘Arthurian Deeds’ or Cycle of the Graal, narrated by Chrétien de Troyes. For this reason the cycle of tales on King Arthur could be said to have its origins right from here. But this ancient medieval sword had belonged to another Knight, Galgano Guidotti, that abandoned a life of dissipation to live as a monk following Christian faith. Two Mummified Arms and many mysteries! In the Lorenzetti Chapel, to the left of the sword, there is a very special case containing two mummified arms! They date back to the 12th century. According to the legend, in 1181 three envious men entered the hermitage to extract the sword from the rock, but they were immediately struck by lightning and bitten by a wolf, who would have torn their hands. Galgano lived the rest of his life in this hermitage, he would have died clinging to his sword and here, perhaps, was buried. According to the tradition, a small sanctuary would have been built on its tomb and then becoming the present hermitage. No trace of his body but the head of San Galgano is kept in a relic in Chiusdino. In the same Chapel you will have the pleasure to admire the frescoes of the painter Ambrogio Lorenzetti, some of them representing scenes from the life of San Galgano. I tell the history of the place and the legend of San Galgano Guidotti also here. Ever been there? Take the time to pass from here…the place is wonderful!